to start out in hiking. to overcome an almost vertical rock face just before the summit. Muntahak (634m asl) from the summit. Other instructions from trip leader. Buy, pack, label, and distribute food to main group. Equipment check & log plan. know who is carrying what etc. we were at the Singapore Customs for around 4 hours total. the jam at the causeway was unlike any other i've ever seen before, and by the time we reached the campsite, we were 2 and a half hours behind schedule. 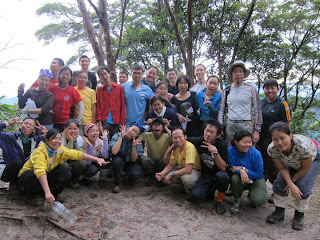 we set off for Pelapah waterfall at around 5.30pm. by the time we reached the base of the waterfall, it was already sunset. the terrain was extremely slippery and narrow. we were almost either balancing like blind ducks in the water on the rocks, or pressing ourselves to the side of the rock cliff surface. due to various factors, we had to turn back at the gorge, after scaling a 3 story high rock cliff in the dark. 1.) our sense of sight was taken away, as there was absolutely no light streaming in from above. our headlights were barely sufficient to even see our feet, much less traverse the dangerous terrain. 2.) our sense of hearing was forfeited, as the sound of water was soo loud, it might as well be roaring in our ears. 3.) the water at the gorge was up to chest-high, and it was still raining, so the water level was expected to rise much higher. after crossing the dangerous portions of the trail, an unexpected situation arose. at the last steep slope down, 2 of our male YFFs fell and injured themselves. one laying on the ground clutching his head, while the other seemed to have a broken foot. we quickly and carefully as we could, we used a safety rope to create a makeshift stretcher, and lined it with the ground sheet to transport the immobolized guy. with 5 people on each side, we carefully lifted him and started moving out of the trail as quickly as we could. after rounds of interchanging the stretcher bearers, re-doing the stretcher rope, and changing lifting tactics, we finally got him to safety in around 2 hours. 3 guys took turns supporting the YFF with the injured foot back to camp, while a team stayed behind with him, cheering him on and keeping the atmosphere positive. finally when we reached the camp, the biggest surprise of all came to us. it was a planned exercise. the 2 male YFFs were only pretending to be injured, to test our response to emergencies. glad and reliefed, none of us flared up openly, and we celebrated over dinner. i think, if this drill took place any earlier, or with a different group of people, the response would have been very different. we stood by each other, shared each others' burdens and worries, without any blame or hard feelings, only because the past 2 months have really bonded us together as a team. 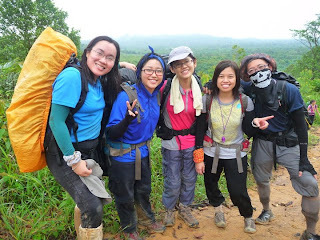 back at camp, we checked through our equipment in the designated 'kitchen', and found that the troupe of monkeys we spotted earlier on had clawed through many of our plastic bottles for water collection, tore a brand new 'Platypus' water bag, and even broke a belgian bottle. 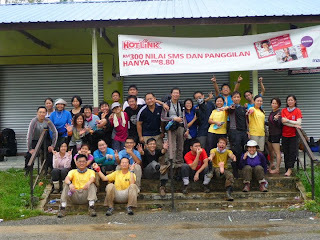 we started our hike to Gunung Panti after breakfast. we planned to reach the rock cliff surface just before the summit at 4pm, but all of us reached at 2+pm instead, well ahead of schedule. the rock cliff was an almost vertical, 80m climb, with a safety rope tied around our waist, at only the first 3m. the remaining 70m had to be climbed using our both hands and feet, and a dangling rope, or whatever roots and branches we could grip. however, the climb was extremely steep and challenging, and some of us were not used to climbing up such heights, so we ( 40 BOATers + YFFs ) took a total of 3 hours for everyone to reach the top. 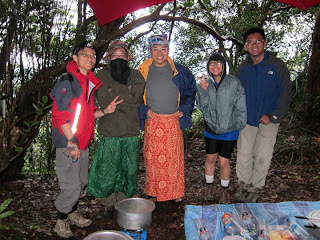 the tents were sent ahead of us, with the guys, to be pitched first in order to save time. 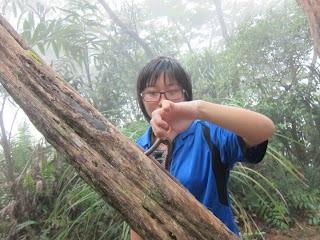 the climb was rather treacherous and challenging, but extremely fun and rewarding. the view from the top was spectacular. we met some Rover scouts from JB at the summit, and learnt how they travel light, create a controllable fire, modify the bottoms of soft drink cans to create a fuel canister, etc. we also spotted a huge millipede the length of my forearm! the thing was so strong i could not dislodge it from the trunk. 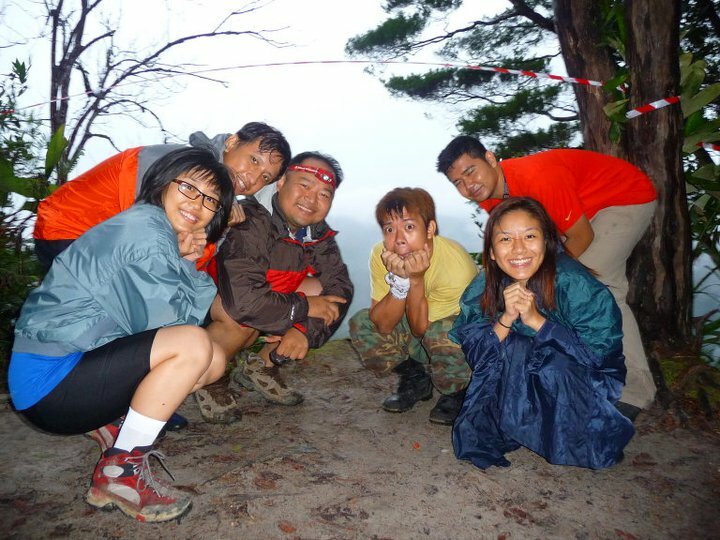 in the night of Day 2, it started to rain at the summit. there, a crisis occured. as the guys went ahead to pitch the tent for us, it was not pegged down, so we could make adjustments if the ground was not comfortable. however, not a single one of my tent mates nor i realised it. i woke up 3 times in the night because of the cold. then i realised, i was soaking wet. when the wind blew, our fly sheet flew. the rain soaked through the tent walls and flooded the sides. at that instance, we noticed that our tent was tilting to one side, and was about to collapse. there was a loud roaring sound, as though we camped in a cave behind a waterfall, and none of us dared to step out of the tent. so we all just sat in the middle and started have a picnic. in the morning, we heard from the Rover scouts that it only rained for a while, but the wind was so strong, it caused the massive roaring we heard. the morning was really cold due to the wind and rain, and the seeing the early morning mist get blown away was utterly breath-taking. after breakfast, we started hiking back to civilisation. 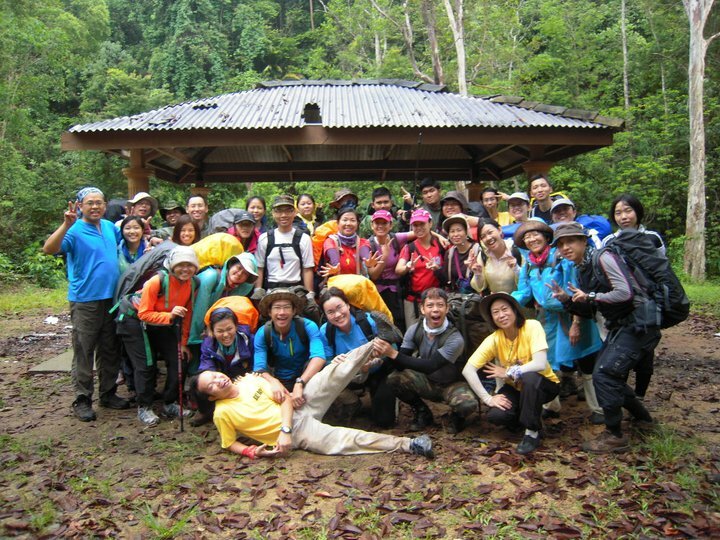 instead of the usual route of going down the way we came up Gunung Panti, our YFFs took us down an almost virgin path. the vegetation was overgrown, and moss was everywhere. some of the the pandan plants we saw had to be at least a thousand years old. the leaves were thicker than my head, at the middle! i could not even see the base of that thing! a few of our team got stung by bees through their clothes, but no serious cases. finally, after a sped-up trek of 6 hours cutting through vegetation and sliding our butts down a 120m rock cliff, all of us reached the base of Gunung Panti. We started hiking pass a kampong village to a town, where our bus would pick us up and send us to the check point. almost everyone were bitten by leeches, but did not realise it till we changed clothes and saw blood. i had 2 bites on my right leg, and a fellow female participant had a leech bite on her chest. in the bus ride back, we had a very fun time singing our throats sore, and announcing the "angels" for the "Angel/Mortal" game we played. in our hearts, each and every one was an angel to each other. 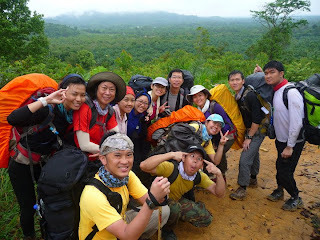 Gunung Panti and Pelapah waterfall were very challenging, yet they awoke the adventurer in me. after this camp, i immediately made a decision to set a goal. i want to climb 100 mountains. hopefully, most of the trips i make will be with some of my fellow 15th BOAT participants. i am looking forward to camp 3!